This year’s ALARM survey has recorded a triumphant headline result for local authorities in England and Wales with the estimated highways maintenance backlog falling by almost 23% to £9.31bn from £12.06bn. The 23rd Annual Local Authority Road Maintenance (ALARM) figures represent the best result for authorities in roughly a decade, after the estimated one-time ‘catch-up’ cost to bring roads into a suitable state had stubbornly held around £12bn for several years. Increased asset management and greater investment appear to have paid off for authorities, now given an annual self-assessment questionnaire with a ring-fenced share of the national Incentive Fund up for grabs for those who manage to get into the higher Bands 2 and 3. England saw a major rise in highways funding despite the continuing challenging picture in local government finance. 'In England outside London the average local authority budget for highway maintenance increased by 20% to £26.2 million (2016/17: £21.8m), 55% of which is funded by central government. However beneath the headline figure there is still a troubling picture for the local road network, with ‘little change in the overall structural road condition reported’ and overall, 20%, or one in five local roads now rated as poor – having less than five years of life remaining. This is equivalent to 40,082 miles of the local network in an unacceptable state. In England and Wales the percentage of roads considered good (with 15 or more years of life remaining) fair (5-15 years of life remaining) and poor (less than five years of life remaining) remained stable. The exception is London, where the percentage of roads classed as good has increased to 51% (2016/17: 45%), while those classed as fair has dropped by a third to 26%. The percentage of the network classed as poor in the capital also rose, from 16% last year to 23% – an increase of 43%. Local authorities report that they are working towards compliance with the new code of practice, which comes into force in October and is a key document courts use to ascertain whether an authority has met its statutory duties. In England 92% are on course to meet the deadline this year, 100% in London but only 63% in Wales. Just over 60% of authorities responsible for roads in England and Wales responded to the report, which extrapolates to find a national picture. The survey does not include councils with a PFI deal.. Sadly the north-south divide applies to highways as well: ‘Local authorities in the north have responsibility for 45% of the local road network in England and Wales, but receive, on average, two-thirds of the overall highway maintenance budget enjoyed by those in the south (£19.32m in the north; £26.95m in the south). The annual shortfall reported for northern authorities is £4.1 million; 52% higher than those in the south (£2.7m). 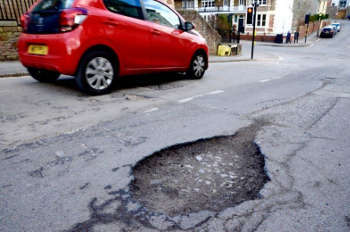 Cllr Martin Tett, the Local Government Association’s transport spokesman, said: 'Careful and efficient management of our roads by councils has seen some progress being made into tackling the backlog of road repairs. However, increasing traffic levels, and more cars on our roads, together with continuing extreme winter weather conditions means that government needs to keep funding of local roads as a priority in its spending plans.